Avoiding the growth of mildew on or inside spa covers is difficult. You can reduce the possibility of mildew by maintaining proper water chemistry BUT lets be honest…life gets busy and maintaining the perfect water balance is not always possible. Luckily, your friends at Aqua Vita Spas are here to help, with step by step guidelines for cleaning mildew from your spa. ENJOY! Allow the encasement and foam cores to dry completely HOWEVER do not put foam cores in direct sunlight to dry- they can melt! Inspect the plastic covering the foam cores for damage. If you find a small hole or rip, contact Aqua Vita Spas for repair solutions. *Unrepaired holes and rips in your cover will result in your cover becoming waterlogged (making it extremely heavy and difficult to open), and the cover will lose its insulating properties resulting in higher energy bills. Place cover onto spa and apply 303 Protectant according to the Cover Care instructions. 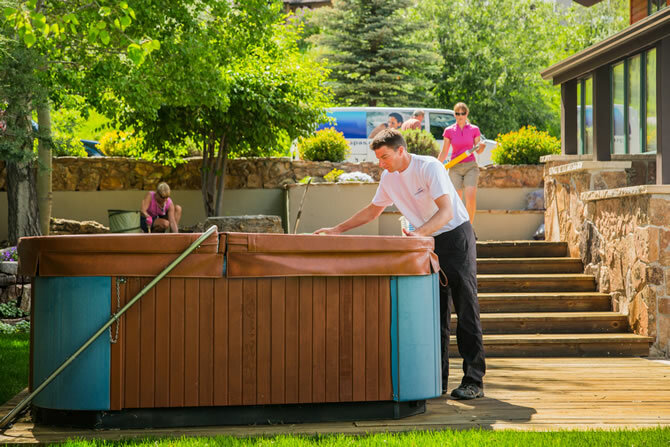 But if this process seems too arduous and time consuming for you to do personally, call your friends at Aqua Vita Spas (970-879-4390) and ask to be added to our Maintenance and Water Care route!